The version history for Defraggler v2.22.995 (22 May 2018) states "Added new Privacy menu Installer". The release announcement for Defraggler v2.22.995 (22 May 2018) states "Added new Privacy menu". Last but certainly not the least - does Defraggler also collect data now to be shared by default with 3rd parties as CCleaner does? And if so, where's the ****ing checkbox to disable this nonsense like CCleaner at least offers? Whoops.... classic case of lazy programmers and lack of testing. Also when the Version history and release announcement refer to a new privacy menu they are referring to the privacy tab in the options menu. I find it really odd that after all these years it has been decided that Piriform wasn't the 'correct' title. Everyone knows who Piriform is, and has always been. 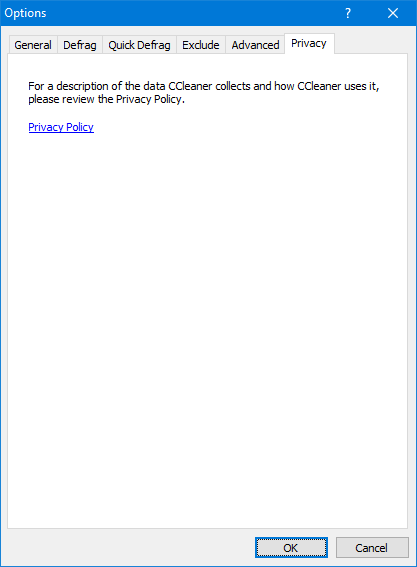 so how do users know that when you say CCleaner you are referring to the company or the program? "For a description of the data CCleaner collects and how CCleaner uses it..."
so if a user sees that in CCleaner (yep, I'm talking about the program), the first reference is to a Company and the second to a Program - or is it??? Everyone knows who Piriform is, and has always been. This could not be further than the truth if it were uttered by El Presidente himself. It's a bug and it will be fixed in the next DF release. The GDPR period was not a fun time for anyone in any software company. this is exactly the kind of comments you (Piriform) should be making in the open forum. it gives CCleaner (the Company) a 'human face' - something sorely missing for ages.